Sow grizzly and twin cubs at an Elk Flats' property. Photo by Patti Sowka. Our ties to the Swan Valley run deep. Shortly after Vital Ground moved to Montana, we completed the foundation’s first conservation easement—a partnership with legendary Condon-area woodsman Bud Moore that protected his Coyote Forest property as both productive small-scale timberland and critical wildlife habitat. Let’s just say the idea caught on in the neighborhood. Word spread thanks to Bud and his family, and by 2013, we had teamed up with six landowners in the Condon area to conserve more than 300 acres of critical lands that help bridge the Mission and Swan mountain ranges. “We are listening to the land and striking a sustainable balance in our part of the Upper Swan Valley,” says Bill Moore, Bud’s son and one of the participating landowners along with his wife, Jean. With five conservation easements and one fee-title acquisition, Elk Flats marks our largest connectivity initiative and a gold standard for local private-land conservation with landscape-scale benefits. Both the Missions and Swans provide prime grizzly habitat, but bears must be able to move between the two ranges to ensure long-term gene pool health for the species. Many cross the Swan Valley to do so, passing houses and roads and working lands. But with conservation efforts like Elk Flats balancing development in the valley, bears, wolverines and other wide-ranging species stand a far better chance at a safe and quiet passage. Of course, the work benefits far more than big mammals. 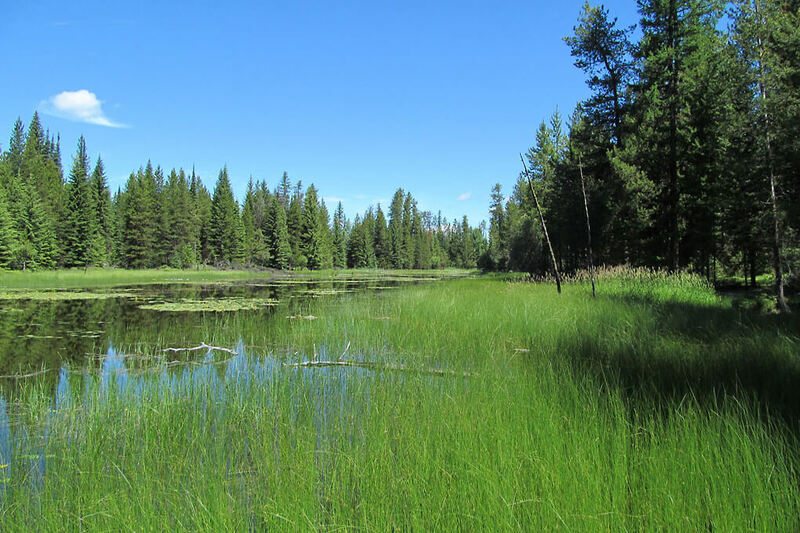 The Elk Flats neighborhood includes the delicate headwaters of Cold Creek, a Swan River tributary and a federally-designated critical habitat for threatened bull trout. Our conservation partnerships protect both water quality and quantity, helping a treasured native fish in its fight for recovery. Two mountain ranges, a developed valley connecting them, and a need for coexistence between the people and wildlife who call it all home—if you need a clear example of the Vital Ground approach, look no further than the Swan Valley and Elk Flats.